How to Add a Custom Channel Grouping in Google Analytics? Direct - Visitors who visit the website directly by entering the URL in the browser or through a bookmark. Paid Search - Visitors who visit the website after clicking ads displayed on search networks. Organic Search - All the unpaid search engine traffic gets reflected here. Social Network - Visits coming from social networks are displayed under this channel. Google currently maintains a database of 400 social networks (approx.) which means visits from those sites are displayed under this channel. Email - Visitors who visit the site through an email campaign are tagged here. Referral - All the visits that cannot be tagged under social networks or any other channel gets displayed here. Display - Interactions happening through a medium of display like Cost Per Impressions (CPM) or through content ads from Adwords. Other Advertising - All the other forms of advertisement other than the paid search gets displayed here. Now, suppose you wish to track visits coming from any other custom channel other than those given above and by default supported by Google, you need to create a custom channel grouping under Multi Channel Funnels (MCF). 1- Log into your GA account and move to the "Multi Channel Funnel" tab. 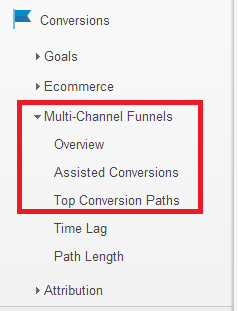 2- Click either on "Assisted Conversions" or "Top Conversion Paths". 3- Click on "Channel Grouping" displayed under main metric table. definitions, rules and a display colour. Next time when any visitor interactions happen through your defined channel, you will be able to see that under visitor metrics in Google Analytics. Hope you enjoyed this tutorial. Stay tuned for even more.